Sydney Writer's Festival and Sweatshop: Writing and Society Research Centre (University of Western Sydney) presents THREE JERKS, created by Michael Mohammed Ahmad at Wharf 2 Theatre, Sydney Theatre Company. It is Sydney 2000. Year of the Olympic Games. A string of gang rapes take place across the western suburbs. The perpetrators are identified as muslims, arabs, middle-easterns and westies. Their victims are identified as non-muslim aussie pigs. The crimes divide Australia. A leb, a wog and a bogan emerge. They are writers. They tell their story. They don't care that no one wants to hear it because they are three jerks. On to the Wharf 2 Theatre stage the three actors, dressed idiosyncratically, individually in 'suits' enter, and locate behind three microphones and podiums. The text created by Michael Mohammed Ahmed, in performance, when spoken (read) reveals itself as an epic poem about the lives and the casual social 'politics' of these three men. The language has the argot of the sub-city of Sydney, Bankstown, enhanced with the peculiar vowel shapes and fascinating musical rhythms that are tantalising for us audience, in their oral expression. Listening to the reading, this language reminded me of the effects achieved by Steven Berkoff in plays such as EAST (1975), GREEK (1980), DECADENCE (1981), and the dialectic authenticities of the cultural sounds of his protagonists. THREE JERKS, certainly, has the similar thrill of a kind of aural authenticity that could take one into the worlds of these men, easily. Michael Polites carries the performance best. There is a surety and confidence in his vocal delivery that allows us, with his accompanying organic gesturing, to see with our ears, the nuances of his character's environment and position in the worlds revealed. Luke Carman, on the other hand, delivers his task at a break-neck speed, and often trips himself up in the communication, literally, and leaves us far behind his vocalised journey - he is engaged with a speed delivery and not a communication of clarity, and one receives, only, a gist of his character and his story. Mr Ahmed has too much earnestness and too much care to seduce us, to convince us of his character. A sense of nervousness intruded on two of the performances and undermined the latent power of the writing as a unique expression of a world that we have not truly heard before, except by proxy with the worlds, works, of Christos Tsiolkas, for instance: LOADED (1995); DEAD EUROPE (2006) and THE SLAP (2009) - the subsequent films as well. Directed by Roslyn Oades, THREE JERKS, has the feel of early development as performance and writing. Ms Oades other work, including the recently seen, I'M YOUR MAN (with Mr Ahmed) has developed an insight and authentic power. With more development, THREE JERKS may grow further. It has been a great month or so, to hear and see new work, in the theatre, from our under-represented multi-cultural artists. Do those who review theatre have difficulty with literature? Three Jerks was not a play and Peter Polites, Michael Mohammed Ahmad and Luke Carman were not actors. 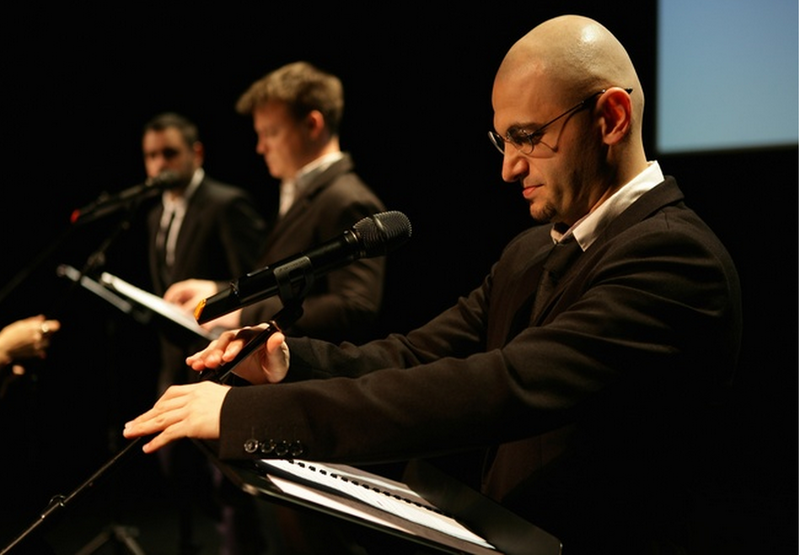 Three Jerks was a reading and Peter Polites, Michael Mohammed Ahmad and Luke Carman are the writers. These three writers each read their own story, which are interwoven with one another. One should understand this going in, especially since the work was presented for the Sydney Writers' Festival.